Powers/Abilities: The full capabilities of this version of the Crimson Dynamo armor remain unrevealed, though it includes it provides a high degree of resistance to injury, super strength, and artillery including small bombs. (Iron Man IV#7) - The Crimson Dynamo robbed a bank in New York City only to be attacked by Iron Man (Tony Stark), who easily repelled the villain through the wall with a repulsor blast. 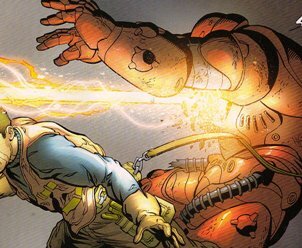 Crimson Dynamo fired several small bombs at Iron Man, but the hero easily survived the explosion. Using magnetics, Iron Man pinned the Dynamo to a steel girder outside. 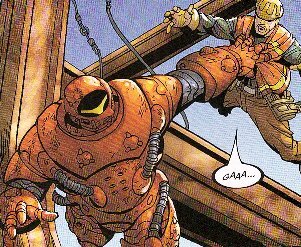 Dynamo grabbed a nearby construction worker, so the hero hit him with a full repulsor that stopped the villain's heart, sending him crashing to the cement below. Iron Man then restarted the Dynamo's heart before sending him into custody. The Crimson Dynamo entry in the All-New Official Handbook of the Marvel Universe Update#2 compares this armor to the Mark II and Mark IV-X Crimson Dynamo armors.